When making sure that your property is secure, it is important to look at all the individual factors as well as the property as a whole. Are your doors and windows secure? Did you replace or upgrade all the locks after moving in? Have you gotten a full survey that has highlighted any potential structural defects? All of these points need to be considered when making sure that your property is fully secure. One other aspect that needs to be considered is your garage door if you have a garage. Garage doors are a constant in larger homes. Garages can be used to store cars or spare furniture, extra foodstuffs, you name it really, and it can be quite easy to forget that you actually have a garage door until it breaks or you need to move a lot of supplies into the house quickly. Then you might find that you have a problem on your hands, particularly when looking at it in terms of security. Garage doors can get forgotten easily and over time will age and wear down against the elements, so upgrading or replacing your current garage door will help towards your ultimate goal of a safe and secure property. So what is the best type of garage door to ensure a secure home? Read on for more information. Often used in commercial properties and warehouses, steel garage doors offer the ultimate in security, durability, and longevity. Multipoint locking is often available for steel garage doors, making them the one stop shop for security if you want to go all out. A steel garage door is designed to withstand almost anything, so you can be sure that if you invest in a steel door, it is likely to remain standing for a good number of years. Many types of steel garage doors are also coated with a tough primer finish to protect them from the elements over time. One of the more well-known and traditional style of garage doors, the up and over garage door provides a simple yet secure solution for choosing your ideal set of doors. Renowned for long lasting strength, up and over garage doors are ideal if you are looking for strong and secure doors in a plain design. They can be operated manually or automatically depending on your personal preference and can also be fitted with multipoint latching, allowing multiple locking points for added security. A good all-rounder. GRP or Glass Reinforced Polyester doors are one of the more durable and resistant style of garage doors. Capable of withstanding rust, splitting, and rot, they also cope well with any bumps or knocks given to them by the occasional stray parked car. GRP Doors are designed to be maintenance free doors and work extremely well in the long run. They are a lightweight alternative to the more foreboding steel garage door style while also retaining a good level of durability. These doors are mounted on tracks that run up the side of the door, where it is stored in a barrel-like compartment at the top of the door. This is ideal for properties where space is an issue, or if you have a short driveway which cannot accommodate a door that has a swinging action. Roller garage doors are also automatic doors and as such are an extremely good choice when looking at options for security. Once the door has closed completely, it is locked into the side tracks and is only operated or opened using the electrical key. This means no external locks that can be broken or forced open. 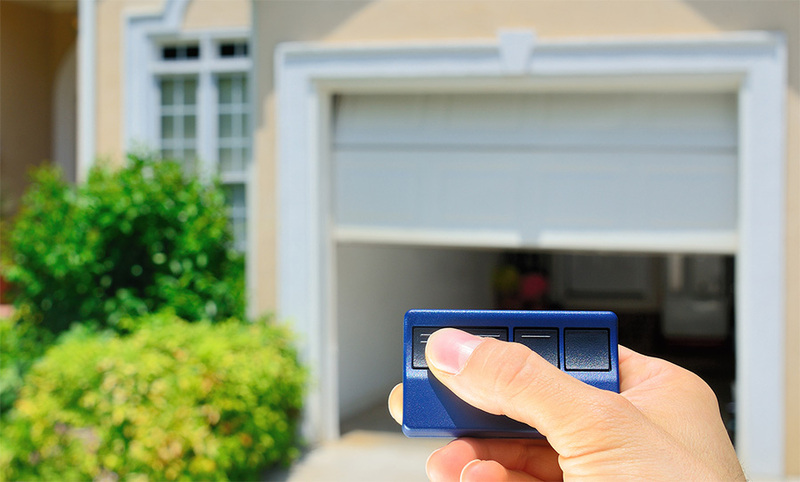 In addition to a brand new garage door, it might also be a good idea to consider installing a motion sensor for your garage. A motion sensor adds a bit of light to the situation when you are trying to park in the dark and can be a real deterrent for potential thieves. Thieves like to operate where they will not be seen and a motion sensor prevents this from occurring, so it works extremely well as a security afterthought if you want a bit of extra safety. With a huge range of different garage door styles available in a number of different materials and colours, you’ be hard pressed to find a secure garage door that does not go well with your property style or colour scheme. However if you do end up having to compromise, you can always try and paint the door itself, or simply learn to like the style as it is. Security trumps aesthetic when it comes to your family home and at the end of the day, if you have spent years creating the perfect home for your family and your lifestyle, it is incredibly important to choose a garage door designed to give you the security you need. After all, if you don’t feel safe in your own home, then where can you feel safe? Article provided by Mike James, an independent content writer working together with the Corporate Garage Door Company, a Bournemouth (UK) based garage door specialist established over 25 years ago.